When the word homemade is used it usually refers to delicious food made at home. In Vietnam, this word can be used in many more contexts because we are quite ingenious in making and repairing things at home. I mean, have you ever heard of a homemade car???? 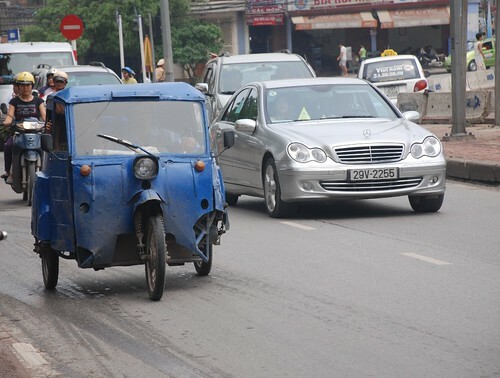 Occasionally I see these kinds of cars around Hanoi and it makes me laugh. They look so cute but are definitely not safe for driving. I am not sure if the goverment actually allows them to be driven on the roads or not. 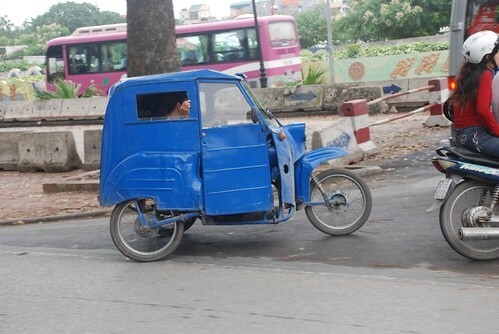 To make these cars, Vietnamese people use the machines of different cars or motorbikes and they shape a new body or frame around the engine and turn it into a car somehow. Of course these cars don't have modern features like air-conditioning or CD players but I wouldn't be surprised if someone is thinking about how to include them. I don't know how fast these cars go but the man I saw was driving it quite fast. At least it was keeping up with the motorbikes. I'm not sure how it would cope in an accident but maybe better than modern cars because it's actually made of steal! Cars are becoming a way of life in Hanoi now but I'm not sure if these models are going to catch. 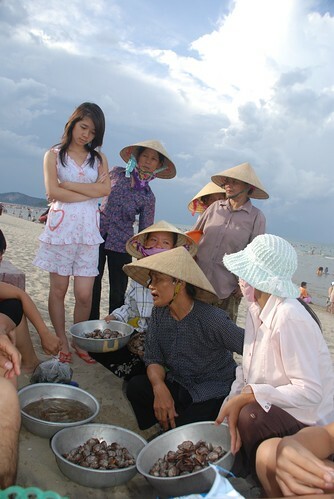 The Sea Festival is one of the biggest events in Nha Trang which happens every two years. 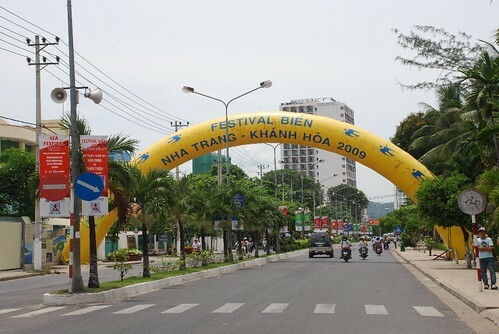 It's a really big time and attracts a lot of visitors to Nha Trang. Most hotels put their prices up unbelievely high. That's not the only thing that's high. The weather is a bit too hot for me, hot enough to burn my feet as I walked along the beach. While I was there last week, it was about 37 degrees everyday but luckily there is a sea breeze so that it's not too bad. My brother's family and I went to the evening fair one night to have a look. 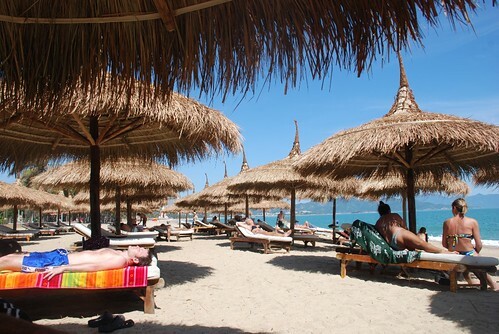 It is right on the beach with numerous stalls and activities. The noise are from all the different speakers around with different music, sale girls voices, together with the crowds made it a bit tiring for me. I lost interest after 30 minutes wandering around the fair. I don't think I'll go to these fairs anymore as it's so boring and most of the stuff on sale is old fashioned and ugly. I missed trying a bowl from the biggest noodle soup show during the festival. This is the first time and a record for Viet Nam for a single shop making a huge pot of pho, enough to serve almost 700 people. Pho Hong is one of the popular noodle shops in Nha Trang. There were also plenty of exhibitions on the beach especially painting and photography shows. I spent over an hour looking at the paintings, which were indeed great stuff. During the day, I went to the Lousiane Brewhouse for swimming and relaxing, drinking some house-brewed beer and reading a bit. I started trying to read more in English last month and it has opened up my mind heaps, a new world for me and for my imagination. 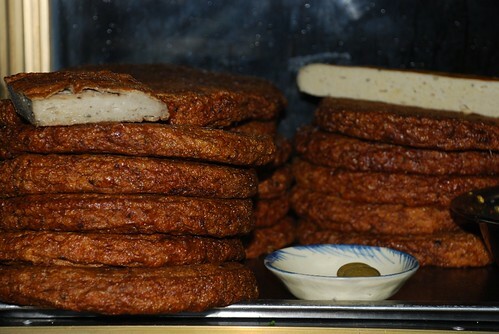 As usual, I went to eat all of my hometown's local specialties for breakfast, lunch, dinner and supper. I just love these dishes and am amazed that they are so cheap. 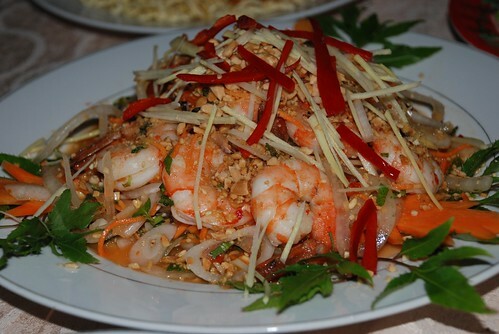 The most expensive dish I had was only 25,000Vnd, which is the same as what I pay for a bowl of noodles in Hanoi or Saigon. I will write about these dishes in the next post. Hope everyone is having a great weekend !!! As I'm a man from the south with a southern accent, I have to bargain for most things I want to buy. I think it's a kind of game and I need to be part of that and play the game with the sellers to the best of my ability, if I don't want to get ripped off. I usually start at 50% of the quoted price with the florists near my place. The process is actually quite predictable and normally includes funny stories about how high the price was that they had to pay. After a while, they normally agree to sell for around 60% of their original price. With ceramic sellers, I usually choose some bowls, plates or vases then ask the total bill. I paid 7,000Vnd for a very nice plate compared to my friends who paid 45,000vnd in the shop. They look exactly the same, no mistake. But when you buy ceremic stuff from street vendors, you need to check each item carefully for flaws which they sometimes try to cover with stamps. Don't worry about taking those stamps off before you pay to check that there is no chip or mark. I normally pay about 45% of the first price when dealing with the pottery sellers. Going to market is even more challenging for me. Most Vietnamese bargain for every single vegetable. I only bargain for veggies if I'm dealing with a vendor for the first time and I generally stand behind another customer to see what the situation is like. 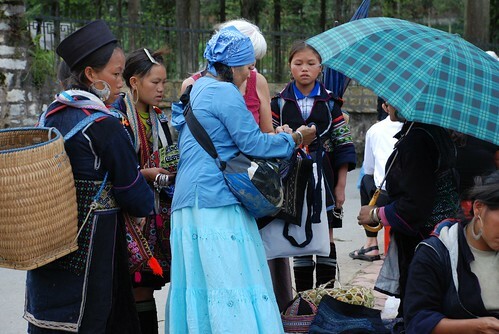 After that I will go back to the same vendor as she knows me. I got terribly ripped off by a chicken seller at my local market, paying 50% more than the normal price. I almost went back to shout at her but she's a damn hard woman and I think I better take it as a lesson and never go to her shop again. One thing that I'm always careful about now is watching what the vendor chooses for me...this is really important. Sometimes, after they agree on a cheap price, they pay you back by giving you the bad produce. 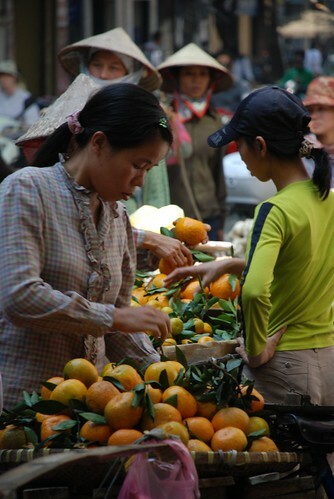 It can be a fun way of shopping in Hanoi and Viet Nam. But I think it's important to remember that "you get what you pay for." 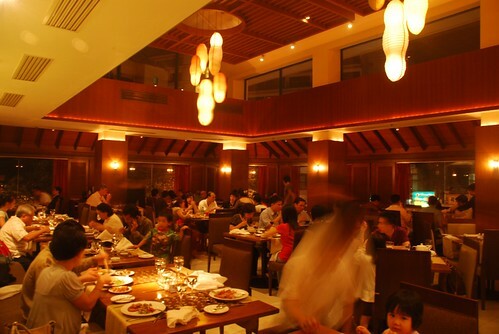 Recently, I was invited to the Sofitel Plaza Hanoi for a birthday dinner at the Brasserie Westlake Restaurant. 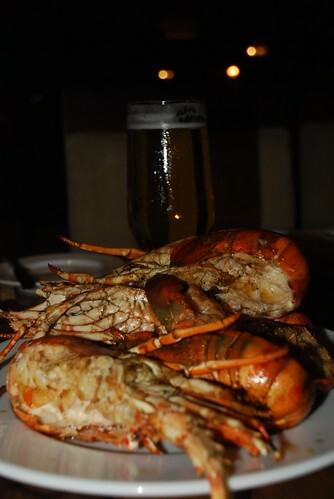 Luckily for me it was a Friday evening, when the restaurant hosts lobster at the most popular seafood buffet in town. 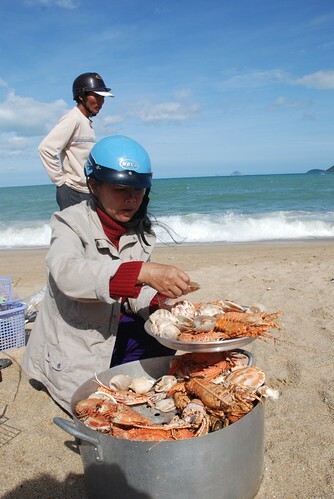 Originally from the south central coast of Vietnam, where seafood is a daily part of the diet, I have to say that I have rarely looked forward to a meal this much. 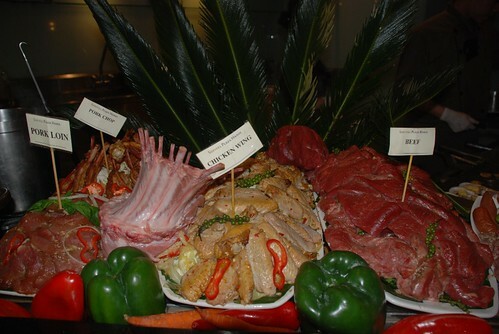 I see buffets as a great chance to really have large serves of the foods that I love or don’t get to eat that often. I really feel like a child in a candy shop. Brasserie Westlake is located right next to the lobby of the hotel with sweeping views of the chaotic traffic on the streets below. A table by the window offers a more intimate dining experience but the space can also cater for large parties. Actually getting to the table can be problematic though, as diners have to walk through the actual buffet area to be seated. I defy anyone who can negotiate their way through such a feast without stopping to consider what they will start with! And the options are immense, not just limited to seafood. Japanese features in the form of sushi and sashimi. Smoked salmon and fresh oysters are located alongside. Salads comprise a large section of the buffet, both those designed by the chefs and ingredients to custom make one’s own, including a nice range of dressings. Hot dishes under shining silver chafing lids vary from night to night and might include Asian inspired curries and stir-fries or dishes from the Mediterranean and other regions of Europe. Carbohydrates in the form of rice, bread and potatoes are available, too. I ignore them as I want to fill up on the fare from the grill. 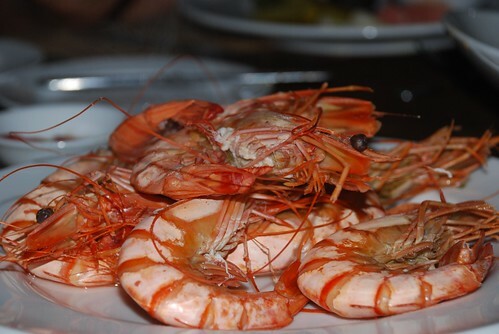 Here, my seafood cravings are satisfied. 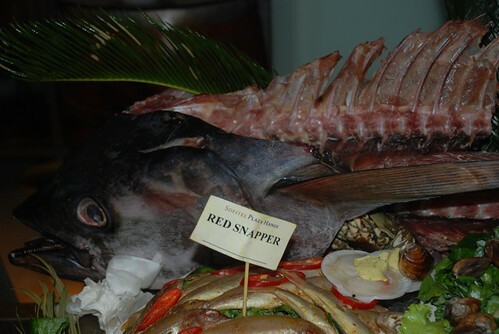 Arranged across a big refrigerated display case are a range of creatures from the seas, including red snapper, sardines, flower snails, prawns, squid, mussels…the list goes on. 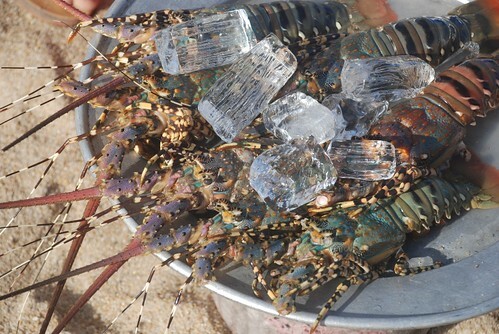 Of course, the star of the show on Fridays is lobster. I thought I’d died and gone to heaven, as I went back again and again to select and watch my seafood being cooked. For those who are allergic to seafood – and I feel sorry for them – there is a good range of lamb, pork, beef and chicken to be grilled up too. 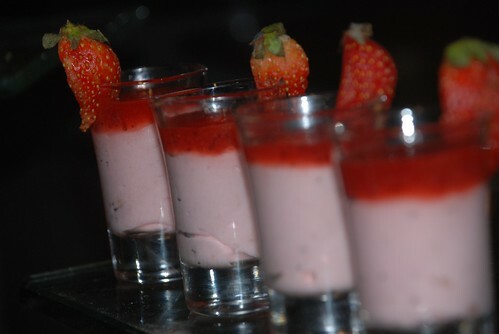 My only problem was that I could not do justice to the dessert buffet. The centerpiece is a fountain, under which pieces of fruit can be drenched in liquid chocolate. Dozens of bite size cakes and little flans in shot glasses lined the dessert trays. A chocolate bread pudding looked delectable and rich. Next time I’m going to leave room. Executive chef Mike Drew and his very capable team at the Brasserie Westlake can be assured by the crowds present on my visit and on most nights that they know how to put on a good buffet spread.